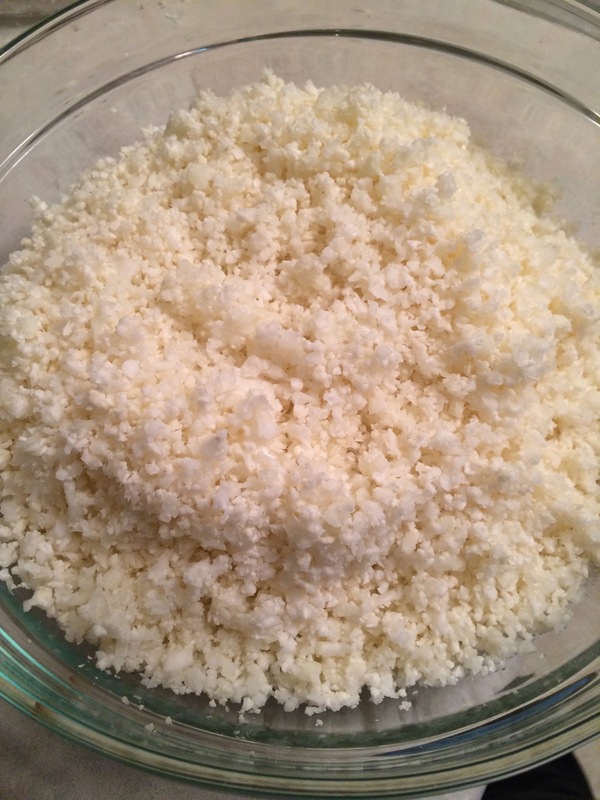 I had seen a few recipes floating around for cauliflower “rice”, aka it’s cauliflower made to look like rice and you can serve it in place of it as a side, and it intrigued me. I am not the biggest fan of rice, really I take it or leave it unless it is say part of sushi! So I liked the idea of a vegetable substitute, which is also a nice change from the typical floret serving! Now as I am probe to do, I sort of followed the recipes I found…but not really. Mostly just the technique and not the exact ingredients as I apparently like garlic more than normal. Start by rinsing the cauliflower and letting it dry off, like you normally would to clean vegetables before eating. Chop into medium sized florets. Using your food processor, pulse until you get rice-like sized pieces. I had to do it in three batches because of the size of my food processor. You will want to use a sauté pan with a lid for this next step. Heat the oil and sauté the garlic till it starts to turn light golden brown. Add the cauliflower, stirring till combined with the garlic. Keep the heat at just over medium. Cover the pan and cook for 6-8 minutes, stirring about every minute to prevent sticking or burning. When done the cauliflower should be hot and tender but still have an al dente bite. Transfer back to a serving or mixing bowl, I used the same one I had in the beginning. Add remaining ingredients, mix well. Serve warm! Betty Note: This was fabulous with turkey burgers! Oh and it reheats wonderfully, it might even be better the next day!